Art Murmur is pleased to present “Animal-esque,” an artistic reflection on the fascinating interconnection between man and beast. Airom Bleicher, Jim Holyoak and Alex Schaefer join forces for this full-scale gallery installation celebrating humankind’s complex relationship with our fellow planetary inhabitants. 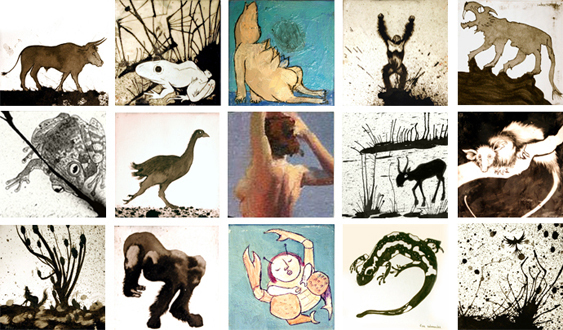 Their work for this exhibition draws on the rich historical tradition of animal imagery in art - from Paleolithic cave paintings and the anthropomorphic iconography of the ancient Egyptians, to Renaissance and Dutch artists who included animals in their work for social and religious commentary. Most recently, contemporary artists employ animals in their art for shock value and as an aid in interrogating the status quo, e.g., Damien Hirst with his controversial installations of flayed cows and dead sharks. For Animal-esque, these provocative artists blend their diverse styles into an intriguing display of painting, sculpture, origami and performance. Bleicher’s interest in primal emotional states complements both Holyoak’s ecological aversion to anthropocentrism, and Schaefer’s curiosity about the tenuous co-existence of humans and animals in urban environments. With global warming and the crisis of diminishing natural habitats, Animal-esque is as important and timely as ever. 10% of all Animal-esque proceeds are being donated to Amazon Watch and IFAW.